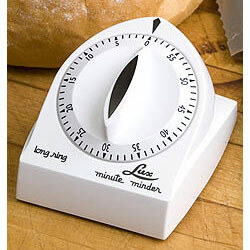 "Compact Timer Rings Long and Loud"
With the Lux 60-Minute Extended Ring Timer you'll get a long, loud ringer that is sure to get your attention. It's perfect for the hard of hearing and was also designed for easy setting with one hand. Use in the kitchen, workshop or darkroom. 4 rubber feet keep timer stable on tables, countertops or virtually any flat surface. Durable plastic case is easy to wipe clean. Color: White. 1-year manufacturer's limited warranty. Measures approximately 4-1/4 L x 3-1/2 W x 2-3/4 H.